While on my lunch break, I went over and bought some Series I Savings bonds, due to their high interest rates described here. Technically I had two more days until the 30th to get an April 2008 issue date, but I didn’t want to cut it too close in case there were any problems. I was also fueled by the news that interest rates will probably dropped yet again soon by Bernanke and Co.
1) Find a bank near you that sells paper savings bonds. Although the TreasuryDirect website says “any financial institution”, not all banks participate. I asked a few smaller ones near work and they did not carry them. The big boys like Bank of America, Washington Mutual, Chase, or Wachovia should all have them. If you don’t have one of these megabanks, just call the biggest banks in your region. 2) Either move funds into an account there, or bring cash. You can’t write a check from another institution, because they need to have the funds immediately. Although I didn’t try, a cashier’s check should work, assuming the bank can simply turn that into cash. I just had them withdraw the funds out of my bank account. Remember, the limit for paper bonds is $5,000 per Social Security number per year. So you can put down $5k for you and $5k for your spouse if you have one, and simply pay $10,000 by yourself. You may also wish to buy something like five $1,000 bonds instead of one $5,000 bond for ease of paper redemption. The issue date of the savings bond will be the same day that the bank accepts payment. This date will be noted on the application, and the bank should also stamp it to confirm. 4) Wait. The forms says that processing will take 3 weeks, and then it will be mailed to you. You can have it sent to a P.O. Box if you have one, for more security. The processing time won’t affect your interest earned because again as long as you paid in April it will be stamped as issued in April 2008. Also, you can’t cash out until after 12 months, so there is no hurry. You can either convert these paper bonds to electronic format at TreasuryDirect and redeem online, or cash them in at the same place you bought them (or any other financial institution that sells them). The cool thing about electronic format is that you can do partial redemptions. They should withdraw the funds on the same day. They filled out a standard withdrawal slip, and my money is gone… Did they not for you? 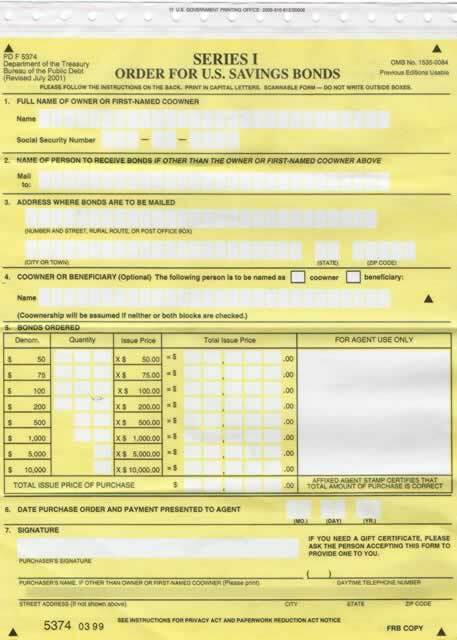 #6 on the form above says “Date Purchase Order and payment presented to agent”. In your case, BofA is the agent. I wrote in 4/28/08, and my bank stamped it 4/28/08 as well. Also, you mention WaMu…I went to a WaMu in southern California and was advised of two things I had not known: 1) they don’t sell US Treasuries but they will redeem them; and 2) they are not a “bank” — they are a…(drum roll)…”savings and loan”. You might recall an institution known as “FSLIC” that went defunct after 1989? Yeah, FDIC accepted the liability for all those defunct S&Ls. And what has WaMu been heavily investing in recently? Subprimes! Just sayin’. Diversifying some money to credit unions (which are insured by NCUA, *not* FDIC) is another form of asset allocation — a rare case when fiduciary duty meets social improvement (lending to groups of people normally underserved by banks, which I feel these days is pretty much everyone). I’m still finding 5% CDs at obscure credit unions! Sorry, I should add that *I* filled out the form, not them. They simply looked it over, took my money, and stamped it. Yes, I agree with your interpretation of #6. I sure did present payment to BofA with a BofA cheque on my date of purchase, which is the date written in #6. Also I didn’t get a stamp, but the teller wrote something in the Big White Square which I can’t quite read. My problem with the I-Series bond is that it adjusts based on the CPI, which is not reflecting the level of price increases, because it ignores food & energy. Granted, the I-Series is likely better than all other US Treasuries. I don’t like bonds in general because the Fed is pushing down rates, while price increases are likely to worsen. Alternative? I take a lot more risk investing in oil & natural gas trusts, but smile every time the news shows record gasoline prices (I don’t own a car). I read on the treasurydirect website that minors can own savings bonds, but does any one know if a minor alone can purchase savings bonds? I purchased bonds at Bank of America. Since I did not have an account there I used cash in addition to a cash advance on my Fidelity mySmart Cash debit card. There is no fee for this on either end. Fidelity limit is $2499/day for bank teller advances (ATM withdrawal limit is only $500/day and counts toward the cash advance limit). The variable portion of the interest paid on Series I bonds is based on “CPI-U” which does in fact take into account food and energy prices. Whether or not CPI-U accurately captures the inflation in these prices is another discussion. I stand corrected. As you suggested, I still have problems with a government statistician determining the rise in prices. In reality, every government is inherently biased toward underreporting any problem. Are the I series bonds tax exempt ? Hey Jonathan, stumbled upon your site when I was looking for stuff regarding Paypal, has been following it closely since. Just wanted to learn something since you’ve brought up these Savings Bonds: how does inflation affect savings account exactly? (to the point that many, including yourself, have recommended these bonds). I’m trying to figure out if there are any true alternatives so as to avoid having inflation eat up what I earn on my accounts, or if we truly are stuck with only trying to keep up with inflation, and can’t really stay ahead of it. Thanks, sorry for the lengthy post. Am I the only who has a dreadful time signing up for a TreasuryDirect account? They want me to mail them an Account Authorization form that has to be signed by an FDIC bank employee (not just a notary). Enough of a pain that I haven’t bothered to do it. That’s standard procedure now (this has been outlined here in this blog). It’s clearly stated in the form that it can’t be a notary, too. Which is fine by me, since I didn’t want to pay anymore just to be able to log in to TreasuryDirect. The only thing the Account Authorization is for is to certify that an FDIC or similar person was present there with you the day you signed that document. I got a reply via email after 7 days saying the hold on my account was removed, and received my Access Card within days after (all in all, took less than 2 weeks). I saw someone who recommends your bolg: MONEY magazine, April, page 120 . I have been a reader of your blog for 2 years. Pentagon Federal Credit Union, 4.49%CD with $1000. Paper I Bonds – I bought my first I Bonds today. My experience is similar to many others on the board, most of the bank employees (Chase) didn’t have any clues about this bond. Only the Bank supervisor & Manager knew about it. As i am not a customer of the bank (i have a credit card but no bank accounts) they were skeptical of letting my buy I bonds. I convinced them to buy and they took a check (NOT a cashier’s check) from other bank and stamped today’s date on the application!!!!! TreasuryDirect.org account – I am supposed to send them the “Account Authorization” form. The chase bank employees said that they can not sign this form. Do you know which banks/CU would be able to authorize this form? Do they authorize it only for their customers or for any one? I am based in NYC. @Jessica – I know you can buy I-Bonds as a gift, and fund the purchase yourself. You can do this online or at a participating bank. @Scott – Signing up online is becoming more and more of a pain. The paper process is actually easier. Not only do you need a signature guarantee (free at most banks), but you need to wait for them to send you the “secret decoder ring” (access card). If you want to buy in April, buying paper bonds is your best bet now. @Terry – That is for a 7 YEAR term. This is only for 12-14 months. The 1-year rate is 2.99%. Also, savings bond interest is exempt from state income taxes. @K – My bet is that you are fine. The agent accepted your check, and only did so because it was an in-bank check, which should count. They might have even put a hold on your account for that amount (which you can’t see, but might call in to check). @Meghdoot – Usually it is free at banks where you are a customer. Are you a customer at any major bank in NYC? It is sometimes called a “signature guarantee” or “medallion signature guarantee”. I was expecting problems signing up with TreasuryDirect online, but I had none. They did not request a signature guarantee from my bank (USAA), and I was able to buy I bonds yesterday that posted as purchased to my TreasuryDirect account today. I’m not sure why.. I walked into a Citi branch today and purchased the paper bonds. The teller couldn’t figure it out at first and could only find a paper application for EE bonds. After calling headquarters (I presume), she told me that it was fine and that she could process I bonds through Citi’s electronic system. She debited my Citi checking account and gave me the transaction receipts. She then told me that Citi will send me the paper certificates in the mail because Citi doesn’t issue them on the spot. This was my first time purchasing paper bonds so I wasn’t sure of the process and it didn’t much resemble Jonathan’s process, but it looks overall to be fine. I logged onto my online account right after and saw the account debit from Citi immediately. I also did not have a problem signing up with TreasuryDirect online and did not have to send in any verification forms. I got the decoder card in about 1.5 weeks time and set up an automatic purchase for I bonds on the 29th. They purchased automatically without a problem. Overall I have had a very easy time with the site. Eric, the bonds will come from the Federal Reserve Bank, not the bank where you pay for the bonds. I have a similar experience as Eric N. buying paper bonds at a Citi branch. The teller did it electronically (I couldn’t see what she is typing and I hope that she doesn’t make any mistakes). I informed her that I want the I series bonds and not the EE series but there is no way to confirm at the time of purchase except her verbal assurance. I also ask the manger to stamp and witness the form that TreasuryDirect but the manager said Citi don’t have such a seal and she is very sorry. I hope another bank that I don’t have an account with will do it for me though it is better to ask the bank that you have an account with to do it. This was so much easier in the old days! Back in 2001, I bought a bunch of I-bonds online from the treasury. All you did was fill out your name, address, and SSN online. They even took credit cards with no fee! (I used to buy on the second to last day of the month with Discover card and essentially got one month free interest plus one percent cash back! Plus my credit card billing cycle fell on the 17th, so I even had another 45 days of float until the payment was due!) Rates were more than 3.4% + CPI, the purchasing limit was $50,000/year, and after you purchased online, they promptly mailed you the bond in the mail. Personally, I don’t think I would even bother with I-bonds at the current rates. TIPS are probably a much better deal all around at this point. can someone explain to me why it still can take checks so long to clear even with the new electronic check system? I was on pins and needles waiting for my 401k deposit to go through wells Fargo. I think they told me it could take 5 business days. This is a similar situation to K above. A quick follow-up on my authorization… my bank refused to give me a signature guarantee! Apparently every employee has a dollar limit on what level of thing they can guarantee, and the account authorization form doesn’t have a dollar amount, so they flat-out won’t approve it. I commented it would be easier to just buy paper bonds and the assistant manager agreed with me. So either I’ll do that, or I’ll keep trying banks. Crazy, since I have a bunch of bonds from 2003 that I bought with a credit card online. They’ve really tightened up. I simply went to the institution that I linked to the TD account; since I am a customer, they did it with no fee and no hassle. I am not sure about the “medallion”, but it was a “signature guarantee”. My husband went to his institution (different than mine) and they made him give a physical address to keep in their Permanent Records. What is this obsession with physical addresses these days? I’m kind of aggravated by that, Teh Terrorists could probably manage using e-money and cell phones without ever giving out a physical address. Moreover, many small businesses are starting off without even renting a physical space, and retirees who sell off the home and take off in an RV are going to be hurt by this requirement. And they are usually the ones that are well capitalized and/or have a good risk-managed business plan, the very ones you *want* to include in a financial system. As usual, bureaucratic “need to be seen to be doing something” overrules common sense…. I bought $5000 worth of I-bonds online using Treasurydirect.gov. The timing worked out just fine… I placed the order last night (4/29/08) at about 10:30pm and the transaction completed today 4/30/08. The bonds say that the issue date is 4/1/08. I’m impressed with the “very next day” transaction, as opposed to the usual, “next day after the next business day after you place a request unless it’s a weekend, in that case you have to wait another business day” you get from most online financial institutions. YMMV.. I already had an account linked so maybe that helped. I would like to share my experience with I Bonds. I think they are terrific. I believe in buying and holding. Tomorrow if the pundits are correct these bonds will all be earning over 8% for their next 6 mo. period. It is disappointing that the gov. lowered the total amount that can be purchased. I have only purchased the actual paper bonds thru local banks. I think the above figures give me a 50% increase of the principal after holding 7 years! At http://www.savingsbonds.gov you can download software to manage your bonds. This spreadsheet is updated monthly with the accruing interest. I also purchased bonds this year even tho they are only earning 4.27% which as things are turning out is beginning to look pretty good too!! 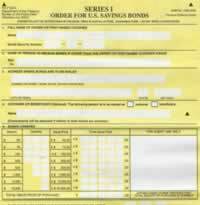 FYI, the fixed rate portion of Savings Bonds purchased between May and October 2008 is now 0.00%…ZERO! 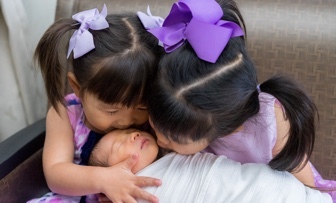 Zero percent surprised me today, but in 6mo, when the fixed rate is negative, I won’t blink. Noble Drusus, are you sure your I-bonds bought online have an “issue date” of Apr 1? I thought bonds bought at Treasury Direct earn interest from the day you buy them and won’t carry the first date of the month as paper bonds do. Ok so that’s what it says on the screen. First of all, let me say that I have enjoyed reading your blog for a couple of months now, but this is my first post. I have an “I-bond question” & I am HOPING you or one of you readers might be able to give me some advice! I was able to purchase some I bonds at the end of April (after learning about it from your website! Thanks!). The ones we purchased in-person through our bank arrived in about a week. However, on the same day I also ordered some for our daughter (a minor) through our credit union’s website. These bonds haven’t arrived yet (it is exactly 3 weeks from the purchase date today.). I double-checked our address w/the Credit Union & they advised that it actually takes LONGER for the “electronically-ordered” ones to arrive (more like 4-5 weeks). They also said they are unable to check the status of them once they are purchased (I do have my confirmation # & it shows the money was taken out of the account on the same day as the purchase). Does this sound normal or should I try to find a # to call the treasury to check the status? Thanks for your help (sorry this is a little lengthy, I just wanted to include all the details)! Anyone had good experience with the signiture stamp from another bank? Sounds like you might need a different Chase branch manager. I have had about 5-10 signature guarantees done at Bank of America as well as local bank at no cost and with zero hassle. I work for a bank and there are no more forms to be filled out. Everything is electronic, and the government sends you the bond to your house. I am debating whether to buy paper I bonds or do it electronically with TreasuryDirect. My husband says do paper because we don’t have kids and if we both go senile we may forget we have an on-line account. But I do have a question. The TreasuryDirect site says something about being able to redeem only $1,000 of I bonds at a time. What does this mean? Does it apply to paper bonds only? I’ve never cashed in anything except EE bonds and I did $10,000 at a time then. My father bought my children bonds from Washington Mutual about 6yrs ago (give or take a yr or 2). We had a robbery and cannot find them how do we replace them, and to add to that they were bought from Washington Mutual. Please email me ljjjesm@hotmail.com with your answers. Next: Do You Have More Questions About Buying A House?